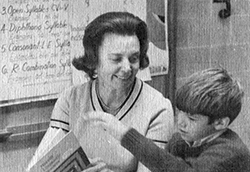 For more than 30 years, Hope Leslie Graham was an integral part of Bancroft School—an inspirational teacher who later served with distinction as Head of Lower School, retiring in 1982. Hope was a compassionate and beloved member of the Bancroft community, greatly admired and respected for her work with students who faced language-based learning challenges. Hope recognized early on that children with dyslexia were gifted individuals, their challenges stemming from neurological diversity, not from a lack of intelligence. Teaching these diverse learners became her passion, and she continued tutoring children until 2003. Hope graduated from the University of New Hampshire in 1942. She pursued childhood language acquisition at Boston University and enrolled in Massachusetts General Hospital’s language clinic. She recognized strengths in children that they were unable to see, or sense, themselves. She was tenacious and never quit as long as the child would show up and try. Many of Hope’s students who once struggled to keep up in school have gone on to distinguish themselves in their professional careers and are compelling proof that her efforts and expertise mattered. Drawing from Mrs. Graham's inspiring example, the Hope Graham Program at Bancroft School seeks to continue her legacy of believing in children and giving students the tools needed to realize their potential. The term "language-based learning differences" (LBLD) refers to challenges that some students face with age-appropriate development in reading, spelling, and/or writing. LBLD may include difficulty acquiring reading, spelling, written expression, math, organizational and study skills due to dyslexia or a specific language disability, and/or receptive and expressive language processing difficulties. Students diagnosed with LBLD typically possess average to above-average cognitive ability. However, since most school instruction is based on reading and writing, LBLD manifests itself in academic challenges for such learners. For additional information on LBLD and dyslexia, please visit the International Dyslexia Association. Will my child be set apart from other Bancroft students? Your child and you will become an integral part of the Bancroft community, one which values and respects diverse learners. Do students with behavioral problems attend the HGP? No. The Hope Graham Program is founded to meet the needs of students with diagnosed language-based learning differences. We seek to admit students with average to above-average cognitive ability who are a good fit at Bancroft School. We do not have the capability to fulfill the needs of students with disruptive behaviors or personality disorders. How do I apply for admission to the Hope Graham Program? If you have not already done so, please contact the Bancroft Admission Office at 508.854.9227. First, you will need to submit a complete psycho-educational or neuropsychological evaluation for your child including a Wechsler Intelligence Scale for Children (WISC-IV) completed within the past 18 months. Following a review of your child’s evaluations, you will be invited to meet with the Director of the Hope Graham Program and Director of Admission. During this time, you will have an opportunity to tour the school, to learn about the program, and to ask questions. Similarly, school personnel will be able to ask you clarifying questions pertaining to your child’s testing, learner profile, strengths and challenges. At the end of the meeting, a mutual decision will be made whether to proceed with the admission process and schedule a two-day campus visit for your child. We're not quite ready for HGP. Do you have any alternative programs? Additionally, during the school year, we will offer the Bancroft Speaker Series, which features informational speakers and forums open to the public on topics related to language-based learning differences. Orton-Gillingham is a teaching methodology that uses phonetics and emphasizes visual, auditory, and kinesthetic (tactile) learning styles. Instruction begins by focusing on the structure of language, and gradually moves toward reading. The program provides students with immediate feedback and a predictable sequence that integrates reading, writing, and spelling. The student is directly taught reading, handwriting, and written expression as one logical body of knowledge. Learners move step by step from simple to more complex material in a sequential, logical manner that enables them to master important literacy skills.